One of the main reasons that these buying guides exist is to help consumers sift through all of the products available in a given market. Some markets are just oversaturated with products that all promise to give the buyer the best bang for their buck. One of those markets is the world of hand tools, more specifically automotive hand tools, and boy, is it ever a convoluted one. Dating back thousands of years, there are almost as many different variations of tools as there are people that use them. Now, you may wonder why anyone would ever bother putting together a list of hand tools when there are power tools that are more versatile, more powerful, and more efficient. Well, as superior as they may seem, there are still many tasks that are just better handled by the use of classic hand tools. From pry bars that help get a project started, to much more precise finishing instruments. Hand tools are just as relevant today as they ever have been, just in a bit of a different way. That being said, I’m sure that there is a tool for every need that, once found, will leave you wondering how you ever got by without it. To find that out, though, we need to take a look at some of what the market has to offer and trust me, it’s a lot. Just like any other buying guide, the purpose of this one is to make it possible to easily and efficiently find the right tool, with the most cost-effective value possible. This one is going to be a bit different, however, since it doesn’t cover just one tool. Instead, this is more of a “best-of-list” that encompasses all of the different types of automotive hand tools available and tries to make enough sense of it all to provide the insight to make that crucial decision. Every one of the tools listed down below is a shining example of its particular purpose and just goes to show just how versatile hand tools still are. So, with all that being said, let’s jump in and see what we can find. This buying guide begins with a relatively specialized tool that many may not be able to recognize, but nonetheless is more than worthy of the top spot. Used mainly to work on the belts found in and around the engine, GearWrench has assembled and released a tool that epitomizes what a belt tool truly should be. More of a complete set as opposed to just a single tool, it contains everything an aspiring mechanic could ever hope for to complete one of the more finicky, labor intensive jobs involving the engine. Anyone who’s ever attempted to change out a belt knows that have the right tool isn’t always enough. This one comes in a complete 16 piece set, to make sure that the job can get done the way it’s supposed to, the very first time, without having to stop to go find the necessary parts. It’s all there, tucked away in a very useful case. Obviously, most tools will last for a long time as long as they are used properly and taken care of. This tool takes things a step further, and is built specifically to hold up toi all kinds of abuse, no matter what the situation may be. If treated with respect, there’s no telling just how long it’ll keep on going. Cheap. That word alone is enough to get anyone’s attention. Not in a quality sense, but in terms of price, this tool does not cost much compared to comparable products. By itself, this wouldn’t be enough to truly convey the value of the tool, but luckily it goes hand-in-hand with other fitting adjectives, like quality, performance, and dependability. Put these all together, and this is something special. A well-built, dependable socket set with a solid range of sizes is arguably the single most important automotive tool found in a shop. Depending on the situation, they can be used for pretty much every purpose. This offering from Tekton is meant to be used as much as needed, and it should keep on coming back for more. It’s advertised as a master set, so it contains virtually any size that can be found on a vehicle, and offers them in both deep and shallow versions. That way, mechanics will never find themselves stuck without the right parts. The tools and parts included in this set are made from a very sturdy vanadium to help them survive all kinds of abuse, and then they’re coated in a mirror chrome finish. This serves two main purposes: It gives the overall set an attractive appearance, and it also gives that extra layer of protection so the tools will last even longer. Not only is this socket set going to include a whole bunch of varying socket sizes, but it’s also going to cover both metric and imperial measurements, opening up a whole world of options. Along with that, each size is included in both shallow and deep versions, so no more scrambling to find a proper fitting socket. This kit packs a wide range of sizes on multiple formats, so for that reason alone the value is already quite present here. To top it all of, the price is also very reasonable, and it can be used for so many different tasks, so there is no excuse for any handyman to not have one in their collection. Ah, Craftsman Tools. Just the name alone can make a reviewer’s job so much easier. Once consumers get a hold of the brand, feelings of dependability and value coming springing to mind. That might have something to do with the fact that they are a company that has been in the business of making high-quality, no-nonsense hand and power tools for longer than most mechanics have been alive. That experience has built them a reputation of reliability that other brands can only hope to one day achieve. There are a couple of Craftsman tools on this list, and either one would be an excellent choice. Craftsman tools have been around since 1927, and in that time, the name has come to stand for quality and performance. So much so, that retail giant Sears made them an exclusive line in all of their stores, and many retailers have since followed suit. That’s because when a consumer picks up one of their tools, they know first hand how well it’s going to do the job. There’s a lot of talk about the quality of this tool, but what exactly does the mean? Well, for one, that means that the tool ios going to last for generations. A lot of mechanics and handymen have at least a few prized tools on their possession that have been handed down from their grandfathers, to their fathers, and finally to them, and it’s a good bet that most of the time, those are Craftsman tools. Classic, affordable Craftsman quality. A well-made tool with such a pedigree is hard to come by at any price, let alone one that will only set the buyer back a few dollars. What they get in return is a ratchet that will do its job time after time, for several years to come. They put a lot of effort in to making a high value tool, and they definitely succeeded. More Craftsman tools. This should not come as a surprise given how highly praised the previous offering was. This time, it’s not a single tool that’s featured, but rather five piece plier set. These ones have a unique, almost odd look about them, helping them to stand out from the rest of the crowd, in more ways than one. They perform as uniquely as they look too, with their ergonomic design meant to provide hours of comfort during the most intensive jobs. As a bonus, that bright green color is going to be impossible to miss on the workbench. On top of making very high quality tools that work well and stand up strong, Craftsman has bundled all of their products with a full lifetime warranty that protects against a variety of risks and circumstances. Regardless of how extensive their warranty is, it’s probably a pretty safe bet that they haven’t had to get in the habit of honoring too many of them over the years. Still, it’s nice to have that added peace of mind. Craftsman decided to go with a bright, almost lime green color scheme for this set, and at first glance this seems like an odd choice. However, the first time one of these tools os misplaces and then immediately found because they stand out so much, everything becomes clear, and the company come out looking like the great innovators that they truly are. An incredibly versatile tool kit that tackles plenty of jobs, with a comfortable design to keep going for hours, all at an affordable low price? Yes please. Everything features in these tools would easily justify a much higher price point, yet they are all packaged together in here, combining to bring an incredible value that is very hard to match and impossible to beat. Now Tekton shows up again. There’s something to be said when a buying guide that strives to be as comprehensive as possible given a limited size and structure keeps coming back to a small handful of brands. That’s not from lack of trying. It just so happens that there are a few brands that have pretty much perfected their game when it comes to top notch hand tools, and Tekton is one of the best. Their hand powered torque wrench delivers power and performance, combined with solid construction and a nice price point. With qualities like that, don’t be surprised to see them on best of lists everywhere. This torque wrench can produce up to 150 ft. pounds pf maximum output, which is quite a bit in general, let alone for a hand tool. This is perfect for at-home mechanics to get the job done without needing to have a bunch of heavy, bulky power tools set up, as it allows them to do more before needing additional power. The scale that is found on this Tekton torque wrench has been designed to be easy to read in even the most low-light conditions. This makes completing any job simple and efficient by not letting light conditions limit performance. Also, the scale can be set in either ft. pounds or Newton meters, so the options are endless. A torque wrench is generally considered to be a specialized tool, one that performs a particular task, and isn’t often found in average tool kits. As such, they do tend to be quite expensive, sometimes ranging in the low three figure range for the top quality models. This particular wrench is priced as a mid level product, but manages to deliver high end performance, exceeding expectations in terms of value. The name Titan screams power and strength. So when a tool manufacturer chooses that as their brand name, the expectations are already quite high before they even produce their first tool. Luckily for them, and for the consumer, Titan Tools lives up to that moniker by putting together products that not only stand the test of time, but their performance never waivers for an instant. Mind you, this may seem like a trivial thing for a pick up tool, but really, in a shop filled with tiny precision parts that can very easily get lost, this pick up tool can all of a sudden become the most invaluable instrument in the building. Admittedly, this is a tool more for the shop, and it wonèt accomplish much when used on a vehicle other than to get dropped screws in an engine block. But that right there is the genius of it. Cars have a lot of small, yet critically important parts, and not having access to them after one gets misplaced will render the entire job incomplete. THerefore, this tool os every bit as important as any other in a shop. Just by nature of its design, this tool will be able to get in to a lot of very hard to reach spaces quite handily. Now, add to that a far reaching ability to stretch out to a maximum of thirty-three inches, and now this tool becomes absolutely indispensable for getting to dropped items that are tucked away and hard to find. This is a lightweight, compact tool that can fold up small enough to fit in a back pocket with ease, allowing for maximum portability. Along with the compact size comes a very compact price point, running only a few dollars. Regardless of the price, the first time it gets used to find one of those expensive little parts around the shop, itès value will increase exponentially. Beginning to round out this buying guide, this selection is a very special tool that comes disguised as an accessory. It’s an impact driver extension kit that is going to add almost limitless versatility and performance to an already high value tool. No matter how good and well-designed an impact wrench os at performing its task, sometimes a given job will present challenges that aren’t typical of everyday use. Cars are an excellent example of this. There are parts and bolts hidden in every crevice and cranny that would otherwise be impossible to reach. Attach one of these extension bars, and those crevices are no longer unreachable. 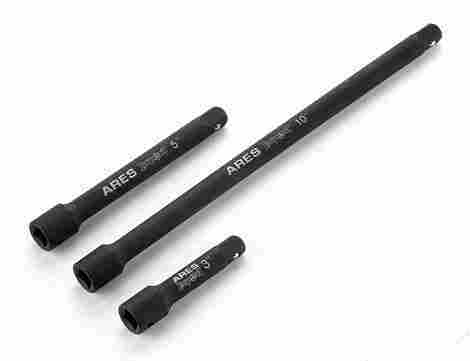 This extension bar set comes with three bars of different lengths, all commonly used for automotive repair. This eliminates the guessing game of which size to have, wince all the sizes are now close at hand, ready to be inserted at a moment’s notice. Instead of offering a single extension bar in a set size that may or may not be the right length, Ares correctly chose to put them all in a set. Really, that’s the only way extension bars should be sold, offering the widest range of versatility and options to a very discerning group of car repair enthusiasts. For this particular three bar set, consumers can expect to pay a fair amount less than the average going rate for similar sets. This may be due to the fact that Ares isn’t quite as well-known as some other brands, but that only serves to work in the buyer’s favor. Low priced, yet high quality make this set an outstanding value. This is one of those tools that is often mistaken as an oddity, to be admired and wondered at for a while, before it is swiftly forgotten. This is not the case this time, however, and those who give the extension wrench a chance are usually left with a new go to tool for their collections. Ir has all the trademarks of a must-have for all types or handymen. 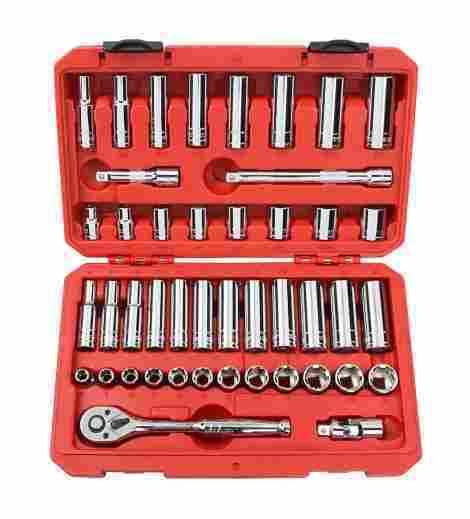 For starters, it’s lightweight and compact, it provides a staggering amount of performance to an existing socket wrench, and it has additional accessories to get even more use out of it. 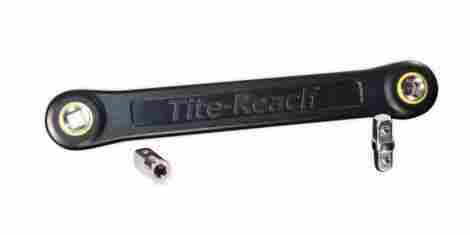 The Do-it-yourself Tite-reach Extension Wrench is only one tool, so it needs to average out the amount of reach it provides to beset accommodate as many situations as possible. It does this quite well, by coming in at an additional eight inches, which is well above average for typical light duty jobs. One often overlooked, but no less important feature of this extension is the fact that it can be used to get in to tight, hard to reach spaces, so that human hands don’t have to, resulting in far fewer scrapes and bruising, which in turn allows users to keep on going and not have to worry about bandaging up any injuries. Any tool that can add to what other tool can already accomplished is already a good deal in most people’s books. 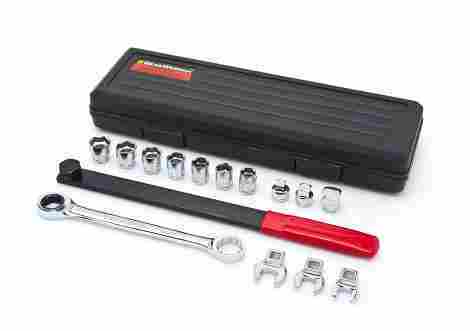 This extension wrench over performs in that category, giving more reach in a variety of sockets widths. All this comes in a convenient package at an especially reasonable price, given the value that it provides. For the final selection to make this list, the tried and true, classic screwdriver. Not just any run-of-the-mill screwdriver, however. This model brough to market by Klein Tools, is an ultra functional 4-in-1 precision tool that can handle the most detailed work. Used primarily for smaller equipment, this instrument is perfect for getting at those tiny, out of the way screws that are found throughout the vehicle’s interior and exterior. The tempered steel construction means that no job is going to be too much for it to handle. Most reviews about this precision tool talk about the durability of the screwdriver itself, yet very few mention the bits. They are the heart and soul of the tool. Without them, it becomes little more than a shell. It’s a good thing then, that they were designed to take large amounts of abuse for a very long time, and then come right on back for more. Klein Tools has got to be one of the longest-lasting family owned companies in the U.S. To be able to last that long while maintaining the same standards set out in the 1800’s is very impressive, and speaks to both the integrity of the company and the quality of the tools. To survive any length of time takes a solid reputation, one thing that Klein Tools has mastered. Most of the tools on this list can claim a low price point, which makes sense because that is a big part of what earns them a spot. 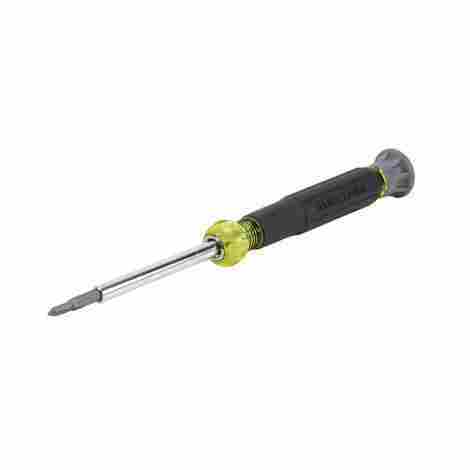 This 4-in-1 screwdriver goes above and beyond because not only is it cheap in relative terms, at is actually the most affordable tool here. While not quite at the level of “Best Value”, for what it does, it more than earns every penny spent on it. As always, the main goal of these buying guides is to provide as much balance to the list as possible, between the most widely used, practical, and cost-conscious automotive hand tools that virtually everybody will use at some point in their lives, and more specialized hand tools that are covered by craftsman of all disciplines. That way, regardless of what the given situation may be, this guide should be able to steer concerned buyers in the right direction toward the perfect tool. It’s designed to be used as a starting point, providing all the tools and resources to continue the research and make your choice, because there are just so many hand tools available, that it becomes near impossible cover all of them in just a few thousand words. That being said, there above are some of the best picks available today, and the rest will inevitably come with experience and good old-fashioned trial and error. Because really, half the fun of working with tools is finding a new and unique item to play with and figure out. The purpose of a given hand tool serves a large part in determining its overall usefulness for a given task. Most tools are designed with a dedicated function, and very rarely stray from that given path. Recently, though, more and more automotive hand tools are appearing on the market that performs multiple tasks to a high degree of quality. Tools such as wrenches that were previously used only on nuts and bolts are now moonlighting as pliers and clamps, among other things. For those tools that can’t by nature be made to perform several functions, manufacturers have been putting together toolsets that contain a variety of hand tools so that the user has a wide array of choices available to them without having to leave the worksite every time they need to switch tools. Certain tools are always going to only be able to perform one specific task, there’s really no way around it. These are often either specialty tools or precision tools. And their function is such that while they are only needed occasionally, the job they do is critical to the successful completion of the task. Certain precision tools, such as torque wrenches, are needed to tighten specific bolts to an exact amount of pressure. Any ore can result in stripping the bolt off, and less can lead to the bolt loosening off. Unfortunately, because of the specialized functions they perform, precision tools are usually much more expensive than more common tools, yet can’t be avoided at all for certain aspects of vehicle maintenance. One thing to be aware of is that many of the manufacturers of automotive hand tools also make tools for various other disciplines. This can make it hard to find the tools needed, as companies tend to make one multipurpose tool that can be used equally by mechanics, contractors, and several other professionals or hobbyists. Price is always going to play a significant role as a criterion for choosing any type of product, and in the world of automotive hand tools, it is as prevalent as ever. There are dozens, if not hundreds of companies that offer automotive hand tools of varying quality, and often the only thing that differentiates them from each other is how much they cost. This is because so many of the newer companies on the market only exist to cash in, making only the bare minimum in terms of quality, while offering a “value price.” Therefore, unfortunately, it is often a safer bet to go with the pricier models, because any knock-offs that are present at this level are often quickly found out due to their inability to compete with the more renowned brands in terms of performance. This isn’t always the case, though, as many brands that have been around for decades tend to rest on their laurels, drastically reducing the quality of their tools while relying on their name alone to push sale. Some of the original automotive hand tool manufacturers are the most likely to deliver the best available product for a mostly reasonable cost. This practice has been honed over generations of producing tools for the working man, managing to withstand recessions and takeover attempts in order to rise to the top of the industry. Some of these companies include Stanley Tools and Craftsman tools. Though some of them have since been acquired by larger brands, they are still, for the most part, left alone to continue to produce the same high-quality products that built their reputations in the first place. One notable exception and a solid example of how to provide excellent quality at a consistent price is Klein tools. Of all of the big name brands found in this guide, they are not only one of the oldest, but they are the only company that is still wholly privately owned. There is no parent company or board of directors to appease, so they have been left to their own devices in terms of production, allowing them greater control over their practices. This freedom gives the consumer a great option if they are looking for exceptional performance that is worth every penny spent. Is the specific brand important? There are many, many different brands of automotive hand tools out there available to consumers, from trusted classic names, all the way down fly-by-night upstarts only looking to capitalize on an uninformed populace. It is for the reason that doing the proper research when finding the right tool is so important. While most of the more reliable brands are those that have been around for generations, there are still some more recent entrants into the market that stress quality of profit, and as such bring a fresh perspective to hand tools. Many of these brands also make hand and power tools for all types of handyman, not just automotive tools. To make things just a bit easier, here is a brief rundown of some of the more trustworthy brand names. Bear in mind though, that not all of the following brands have representation on this list, but that is by no means an indictment of their quality and performance. The only reason that they don’t appear is due to space constraints. Craftsman: Craftsman produces hand and power tools, as well as yard and garden equipment, though they are most well-known for their high quality hand tools. Founded in 1927, Craftsman is known as a “middle tier” brand, and started by producing tools primarily used to repair farm equipment. Originally, they were created and owned by sears as a proprietary brand sold exclusively in their stores, but the company was sold to Stanley Black and Decker in early 2017. Mac Tools: An American company that produces mainly professional grade tools and equipment. They make automotive hand tools as well as pneumatic tools, and were first introduced in 1938 as the Mechanics Tools and Forge Company with the goal of manufacturing high-quality mechanic’s tools. In 1961, the company changed its name to the more familiar Mac Tools brand, and was acquired by the Stanley Works ion 1980, and now makes up part of a group of tools that includes Stanley, Proto, and BlackHawk. Klein Tools: A privately owned tool manufacturer that has been in existence since the mid 1800’s, Klein is most popular in the electrical and telecommunications industries, though their tools transcend disciplines. Their lineup currently includes over 3800 tools, many of which are trusted by mechanics everywhere. Stanley: Stanley tools was originally founded as the Stanley Works in 1843. The company started by manufacturing bolts, rules, and levels. In addition to producing their own line of automotive hand tools, Stanley has acquired several well-known brands that produce them as well, such as Mac Tools, Facom, Proto, and Expert. As long as the consumer remains aware of what brands are out there, and what level of quality to expect at a given price point, then the act of choosing the perfect automotive hand tool for whichever task they had in mind is not really going to be all that difficult. It’s simply a matter of weighing the requirements against how much they want to spend. Concerning hand tools, people really do get what they pay for, and that in and of itself can be a very accurate way to making the right choice. Extension bar: A solid steel bar that attaches to the ratcheting mechanism of a socket wrench, and has an adapter at the other end to allow the socket to be secured. This bar adds extra length to the socket, letting it get in to hard to reach areas in order to loosen or tighten a bolt. Extension bars are most commonly found in auto body shops, as the complicated nature of engines and other parts, combined with the limited space found within the vehicle, can inhibit mechanics, preventing them from accessing certain parts or areas. The most common sizes for extension bars are three inches, five inches, and ten inches, though other sizes are readily available. Forged steel: Forged steel is made by a manufacturing process called forging, which involves shaping the metal by applying compressive force, such as a blow from a hammer. Forging can be cold, warm, or hot, depending on the temperature at which the work is performed. Forges steel can range from being relatively lightweight, to weighing several hundreds of pounds. Forged steel is a preferred material for the production of hand tools due to its high strength properties as well as the relative ease and low cost to produce. Locking tools: Locking tools are designed to lock on to a nut, bolt, sheet metal, or other surface, acting as a sort of third hand, thereby holding them in to place while performing a separate task. To release a locking tool, usually a lever found on the inside of the handle needs to be tripped, though some locking tools only require the handles to be pulled apart. The main components that give locking tools their functionality are a fixed handle, adjusting bolt, movable handle, connecting rod, as well as a fixed jaw and moving jaw. 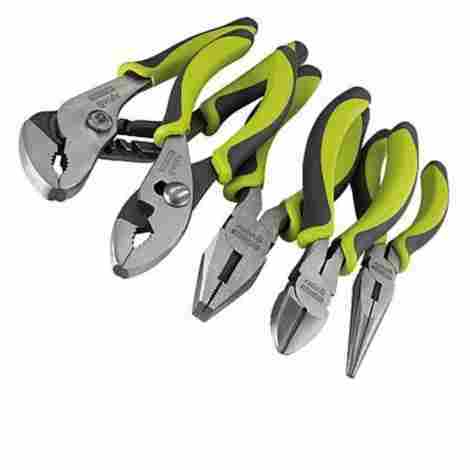 The most common locking tools are locking pliers, and C-clamps. Mechanics: Also known as an automotive technician, a mechanic is tasked with diagnosing what exactly is wrong with a vehicle in a quick and efficient manner before beginning to perform the repairs necessary to fix the issue. Mechanics can specialize in one particular make or model of vehicle, or they can be a “jack-of-all-trades” of sorts and work on a variety of different types of vehicles. A major part of a mechanics job function, primarily in North America, is to perform basic preventative vehicle maintenance in order to avoid a major problem occuring and becoming very costly for the owner. 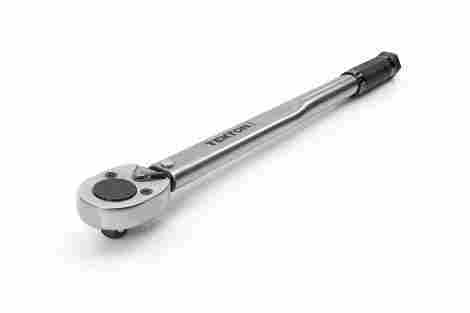 Ratchet: Ratchet is an informal name given to a ratcheting socket wrench. It is a metal handle fastened to a ratcheting mechanism, which in turn attaches to a socket. 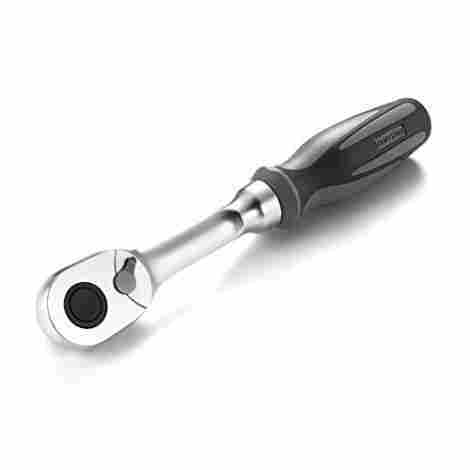 The ratchet can be used to loosen or tighten bolts. The direction the ratchet turns can be changed via a switch on the back. If turned in the opposite direction it is set for, the ratchet will not begin to work in that direction, but will rather allow the user to re-position the handle for another turn while keeping the socket and bolt stationary. Socket: A bit that attaches to a socket wrench, or ratchet, which contains a cut out shaped to resemble the heads of certain bolts, in order to apply or remove them using a significant amount of force while not requiring much energy to be expended. Sockets are typically cylinders, and the cut out is known as a female, or recessed opening that contains either six or twelve points to better fit over the male hexagonal bolt heads. The other end of the socket has a standardized square slot to allow it to attach to the ratchet. Tap and die: These are specialized tools that are used to create screw threads. A tap is used to create the interior threads such as in nuts, while the die is used for the exterior, or male threads, sound in screws and bolts. The process using the tap is known as tapping, while the method employing the die is called threading. Both the tap and die can also be used to clean up threads, which is called chasing, though using them will increase the risk of looser and weaker threads due to the loss of some material. Torque: Torque measures how much a force that is acting on a particular object causes that object to rotate about an axis. Torque is considered to be a fairly reliable measure of how quickly a motor will accelerate. Q: Why should I use hand tools instead of power tools? Power tools are great, there’s no question about that. They make life a lot easier by quickly taking care of what would otherwise be a very tedious and mundane job. Unfortunately, while power tools work well with larger, more straightforward jobs, they sometimes lack the precision and finesse required to perform some delicate tasks. For example, when working on the electronic or computer systems of the vehicle, many find that power tools are just too abrupt and powerful to be trusted. Instead, it takes a slow, steady hand and a high-end, precision screwdriver to take care of the finer details and smaller screws. For some mechanics, as well as others who enjoy working on cars, the answer is simpler even than that. They just prefer to get in there an do the work themselves, viewing the hand tools as an extension of their body, giving them much greater control over what is happening in that particular moment. Q: Can hand tools do the work as well as power tools? For the most part, hand tools can perform exactly the same task as that of a power tool. In fact, before power tools came along, people had no choice but to use hand tools and were stuck until the job was completed. The only difference is, while hand tools are just as effective, they are much slower than their powered counterparts and can cause a large amount of discomfort to the user due to the increased length of time to complete the job. Q: Are hand tools still around? Hand tools have been around for thousands of years, and are most likely not going anywhere anytime soon. As long as there are jobs to do using tools, there are going to be people who insist on using hand tools. For many people, they provide a much greater sense of accomplishment than by using an electric or pneumatic power tool, while for others, there are some finely-detailed tasks and finishing touches that a power tool just can’t manage as well. Q: Are hand tools expensive? In general, hand tools do tend to be on the cheaper side of the spectrum, especially when compared to most power tools. However, thanks to a recent surge in popularity, the price of hand tools has begun to rise to new heights. Also, bear in mind that there are a lot of hand tools on the market that are considered specialty tools and only perform a very specific, uncommon task and as such, can be considerably more expensive than the more common tools. Q: Are hand tools safer than power tools? Despite the obvious answer being yes, the truth is that neither power tools or hand tools are inherently unsafe. What they do is present a risk to those users who are improperly trained in their use or those who are just careless or foolish. In order for any tool to be considered safe, it is up to the person performing the task with it to be aware of how to use it, what not to do, and also what is going on in their surroundings. Now naturally, tools with blades or moving parts are likely to pose a greater threat, but as long as sufficient safety protocols are followed, almost anyone should be able to use tools in a safe and efficient manner. Quora.com – How worthwhile is it to learn how to fix your own car?